Nokia X5-01 is currently not available in any stores. Watch your favourite video songs and movies in video player. It supports MPEG4, H.263, H.264, WMV, 3GPP, RealVideo 7, RealVideo 8, RealVideo 9, Flash Video file types. Listen to your favourite songs in music player. It supports MP3, AAC, AAC+, eAAC+, WMA, WAV, RealAudio 7, RealAudio 8, RealAudio 10, M4A (Apple lossless), MP4, etc. file types. 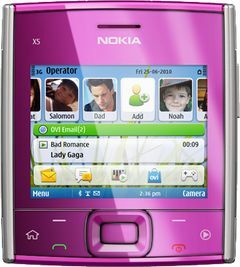 The squarish Nokia X5-01 is way more than just another square-shaped mobile phone. Its a smartphone, a messenger, a music player, you name it. Nokia's X-Series music phones are about to prove Huey Lewis and The News correct, settling once and for all that it is indeed hip to be square.